Emerging cybercrime is a big reason for us to worry about the security of our smartphones. It is a constant endeavor to safeguard our iPhone by updating security apps. For real time protection, we set a passcode or a figure print lock but, did you know if you use a passcode then it can be guessed easily? 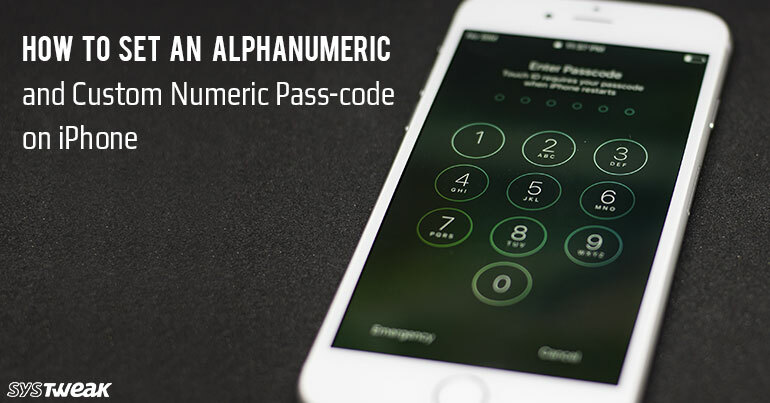 You can use a complicated passcode on your iPhone by setting an alphanumeric one. Alphanumeric passcodes are considered much more secure. In fact, you might have noticed that on most of the websites when you try to create a password they only accept an Alphanumeric passcode. Not only this, you can also set a custom numeric passcode on your iPhone which means that your Passcode will not be limited to just 4 or 6 digits. So, let us find out how you can set a complicated passcode to enhance the security of your iPhone. Now scroll down to Touch id and Passcode. It will ask you to enter your Old passcode. Once you enter the old passcode, tap on Change Passcode. You need to enter your old passcode again. After that it will ask you for a new passcode. Here, you will also see “Passcode Options” in blue color. Tap on “Passcode Options” you will see three options excluding the format of your previous passcode. Choose from Custom Alphanumeric Code or from Custom Numeric Code for enhanced security. 8. If you will choose Custom Alphanumeric Code then you will be able to set any combination of letters and numbers as your passcode. You can also include symbols this makes the passcode stronger. 9. If you will choose Custom Numeric Code then you will be able to set any combination of numbers of any length as your passcode. Here it is not recommended to set your cell number as your passcode because it can be easily guessed. This is how you can Make your iPhone much more secure. Even if you use touch id to unlock your iPhone then too you should not compromise with the passcode because your iPhone can also be unlocked with passcode.